12-0 run for Iowa. Badgers scoreless in the last 5:44. #Badgers TO total at nine and counting. Sloppy with the ball. Koenig's drive and finish ends a run of 10 straight empties for the #Badgers . Iowa up 29-25. #Badgers had Moesch on Bohannon and he contested a corner three. Koenig with a drive and it is 29-25 Iowa. Final min. Bronson Koenig ends a 6:42 scoring drought for Wisconsin. Badgers averaging .781 points per possession in the first half. Koenig drives to the rack and finishes. He's into double digits with 11 points for the #Badgers . Timeout Iowa. Koenig with a great drive to cut the Iowa lead to 4. 26.1 secs left in 1st half. HALFTIME: Iowa 32, No.22 Wisconsin 25. Hawkeyes go 7-for-11 from 3-point range. Halftime: Iowa 32, #Badgers 25. Baer with 12 points on 4-of-4 shooting from 3-point range. The #Hawkeyes close the half on a 15-2 scoring run. Nicholas Baer leads all scorers with 12 points. First half ends fittingly: Baer a 3 for 32-25 Iowa lead over #Badgers . Iowa, 35.7% from 3 in B1G, at 63.6% (7-11). PPP: Iowa 1.03, #Badgers 0.81. Iowa 7 of 11 from 3-point range. Iowa's Nicholas Baer averaging 6.9 ppg in B1G play. Had 12 in first half (4-4 from 3). Iowa has just 2 points off #Badgers ' nine turnovers but the empty possessions are killers. Bench points: Iowa 14 (Baer has 12). #Badgers ? Zero. B5Q "Keys to the Second Half" - score eight more points than Iowa. Starters back in for the top of the second half. Back for the second half. Bring it in. Let's go. Both teams awful so far this half. Iowa is last in the Big Ten in scoring defense overall (77.7) and in conference games (79.1). UW has 25 points after 21 minutes. Tyler Cook whistled for two early fouls to start the second half; he sits with three personal fouls with 18:35 left. Wisconsin's first bench points comes from a Trice jumper at 18:22. 32-27 Iowa. I don' think #Badgers will be able to score enough to rally tonight. 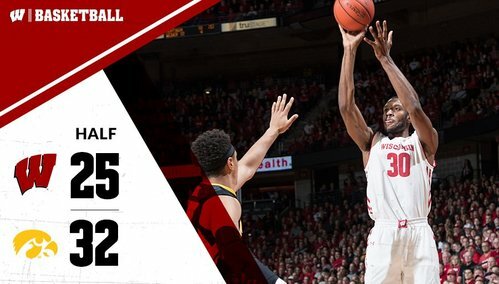 Nigel Hayes takes it baseline, draws the fould... AND-☝️! Iowa lead down to 4. Nigel Hayes takes it baseline, draws the foul... AND-☝️! To be fair, Zak Showalter's swim move made him look like J.J. Watt on that foul call. And-one for Hayes. FT good. Iowa up 4. #Badgers with 4 fouls in 19 seconds. A four-foul possession for the #Badgers . That's a new one. UW's offense finally picking up. Now, it needs some stops. Iowa up 41-37 with 14:59 remaining. Bronson Koenig carrying Wisconsin up to this point. He has 16 points and has a FT coming up. Badgers trail 41-37 with 14:59 left. All of a sudden we have a scoring outburst: Iowa 41-37 lead but #Badgers Koenig at line for and-1. BK can finish off a 3pt play the old fashioned way after the timeout. He's got 16pts.